I have tried Jols a couple of times and I find these are quite tasetless and tough chews and way too tiny to enjoy as sweets. I have tasted other sugarless chews and at least they have some flavour in them and tastes good. Really not a fan of these lollies. I really enjoy having these Jols pastilles as a treat. They have a nice fruity flavour and satisfy sweet cravings. I wouldn’t recommend having too many of them though because you might end up frequenting the toilet. I had it a while ago, and then recently my hands reached out for it, soon after the first bite I remember why I haven’t been getting them, nothing to run back for, the taste was a little bland I’m afraid. I tried these a long time ago and will not go back. While the flavour is ONLY OK, the fact that they are hard to chew and there is aniseed aftertaste. No thanks. 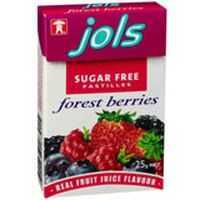 How would you rate Jols Sugar Free Pastilles Forest Berries?